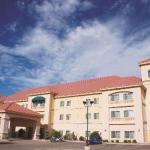 Offering free high-speed internet highly convenient I-40 access and a tasty free breakfast La Quinta Inn & Suites Tucumcari is a solid bet off old Route 66. This three-floor pets-welcome establishment aptly offers 66 rooms including non-smoking options. Common areas and rooms are quite modern and chic with a streamlined style and fresh snappy textiles. Guests can kick back in the privacy of their rooms equipped with free high-speed internet microwaves and mini-fridges. Upgraded bedding and linens pillowtop mattresses and massaging showerheads make it easier to rise and shine. The free daily breakfast buffet with just about everyone's favorite fresh waffles is quite the hit. Guests can hit the fitness room to get the blood flowing or ease their tired muscles in the indoor heated pool and hot tub. Parking is free. Two blocks off I-40 the hotel works for those just passing through or sticking around to enjoy the area's famous attractions. Get up to speed fast on Wild West and Route 66 history with a visit to Tucumcari Historical Museum one-and-a-half miles north. A favorite attraction among big and little kids is Mesalands Dinosaur Museum equally close. Tucumcari Municipal Airport is eight miles Rick Husband Amarillo International Airport is 121 miles and Albuquerque International Sunport is 178 miles away. Dogs of all sizes are allowed for no additional fee; there is a pet policy to sign at check-in. Dogs may not be left alone in the room.